Unwanted moisture can cause problems for your home or building. It can lead to hazardous mold growth which can endanger the health of your employees, occupants and loved ones. Moisture and mold are most commonly found in basements, attics, and crawl spaces and it's possible for them to go undetected for some time. To eliminate moisture, the source must be identified and addressed for long term solutions. Attics are usually not properly insulated or ventilate, leading to moisture retention and mold growth. In order to properly control moisture and prevent it from building up, the source must be identified and the problem corrected. AdvantaCleans's moisture specialists are here to diagnose the source of attic moisture and will recommend the best course of action for eliminating it. Another infrequently used space in your home, crawl spaces are a very common place for moisture and mold. 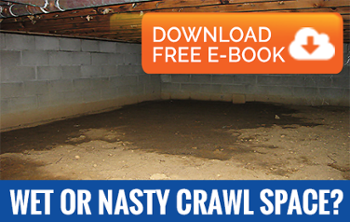 Crawl spaces usually have an exposed dirt floor, allowing ground moisture into the space. Without properly barriers or ventilation, this moisture is trapped and provides the perfect environment for mold growth. AdvantaClean has the knowledge and skills you need to address the source of moisture and correct it. For moisture issues, prevention, and support, call AdvantaClean today! We're happy to help you take back your home from unwanted moisture and mold. Call us to schedule an appointment with our mold and moisture specialists!